Sunday was a sunny, warm and pleasant day so it seemed a good idea to have a forage for late season fungi. The route took us through the wilderness, along the path from Earley Gate to the Library and then to the cedar trees by Park House. There was hard frost on Tuesday so I had concerns that there might not be many fungi left. The Wilderness was first on the walk. A mixed woodland of oak, chestnut, beech, birch, hazel, holly and assorted conifers with an understory including too much Rhododendron! An upright but very dead Betula trunk yielded some good specimens of the birch polypore. Birch polypore (Piptoporus betulinus) on a decaying birch (Betula) trunk. A common and typical bracket fungus. Birch polypore (Piptoporus betulinus) on a decaying birch (Betula) trunk. An unusually wavy specimen. On a nearby log, and widely throughout the wilderness on fallen trees, there were several smaller bracket fungi. Young growths that might be Stereum gausapatum, a small bracket said to bleed red if damaged. A common bracket fungus, Trametes versicolour, the many zoned polypore or Turkeytail. Smaller toadstools were also abundant and I still have many to identify. Here is a selection. Once out of the wilderness I walked to the centre of campus where the magpie ink caps were still in evidence. Coprinopsis picaceus, the magpie inkcap showing the typically dark cap with white patches in this young toadstool. Some of the most fascinating fungi were seen under the Cedar trees by Park House. Opposite the cedar trees on the sloped garden approaching Park house were several clusters of Ramaria stricta (or similar) that appeared to be growing from the wood chips but may have been on rotting wood underground. Under a nearby oak was a rather decayed specimen of Hen of the woods. Without doubt the most disgusting fungus of the day with a wobbly, slimy and wet texture reminiscent of overcooked pasta that has been abandoned for a week. Grifola frondosa Hen of the woods. Detail of inside of fruiting body. 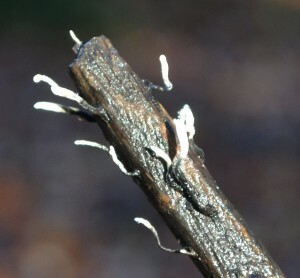 On entering the Wilderness again several twigs were spotted with candle snuff fungus, Xylaria hypoxylon with its distinctive black and white colours. On the edge of campus we found Helvella crispa by the path and just off campus a very large and fine Chicken of the Woods. Having seen both Hand of the Woods and Chicken of the Woods I wonder if there should also be an Egg of the Woods to complete the fowl references? If you can name the unidentified fungi do please comment below. This entry was posted in Fungi and tagged Birch polypore, candlesnuff fungus, Chlorophyllum rhacodes, Clitocybe, Coprinopsis picaceus, Coriolus versicolour, Grifola frondosa, Helvella crispa, Hypholoma fasciculare, Laetiporus sulphureus, Leratiomyces ceres, Mycena, Pholiota, Piptoporus betulinus, Psathyrella conopilus, Ramaria stricta, Russula, Stereum gausapatum, Stereum hirsutum, Xylaria hypoxylon. Bookmark the permalink.